The scapes are in season and Laura gave me a tip on how to process them so that I can have local organic garlic in my food all summer long. This is pretty exciting for me since this time of year it is harder to find any local garlic bulbs for sale, and although scapes are in season now they won’t be here for long (we finished harvesting all of ours at Riverbank today). The best part? 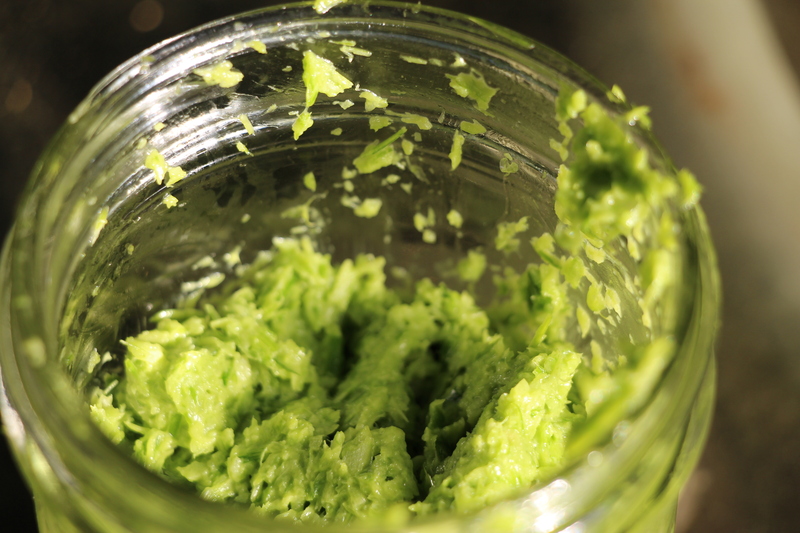 Not only is this Scape puree easy to make, it makes cooking with garlic a breeze! Plus, you can feel good about knowing you’ve added one more local (hopefully organic) ingredient to your dinner tonight. Blend in a food processor until fully pureed. Store this in a jar in the fridge and use a tablespoon as a replacement for 3 cloves of minced garlic in any stir fry, salad dressing, soup, stew, etc. If you have the ingredients, make some extra and store it in the freezer to use when you run out of your first batch. Laura says she keeps hers in the fridge and it lasts her all summer until the garlic bulb harvest comes in. 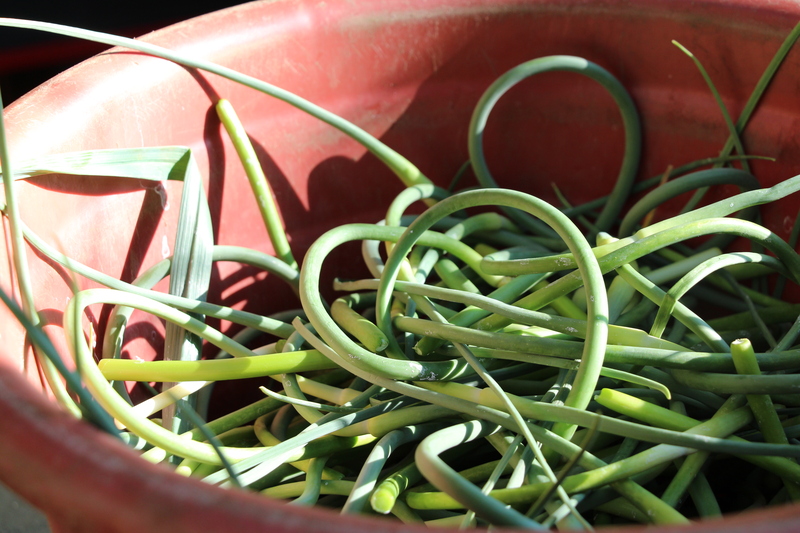 Briefly about scapes if you don’t know what they are: A scape is a long flowering stem that grows out of a garlic plant. Before it flowers however, we pick it off which makes the plant put energy into creating a bigger garlic bulb. These scapes (pictured above) taste just like garlic and make a perfect addition to any meal. I also hear a rumor they can be pickled, but I haven’t explored this yet.